Possums often live inside the attic! They are great climbers, with their opposable thumbs and prehensile tails, and they have no problem climbing up the side of your house, maybe at a downspout, maybe by a tree, and getting onto the roof. If there's an opening leading into the attic, they will go in. An attic is a warm, dry, safe place to live in. "Fantastic! thinks the opossum. The most frequent time of year to have a possum living in your attic is in June, when the young are starting to get bigger, too big for the mother's pouch. She seeks out a safe place to spend her time, and keep her young safe. This is a problem, not only because all the possums poo in the attic, but because the young tend to wander around, and they often fall down the walls, and then they scratch and eventually die and stink. How then, do you get rid of possums in the attic? Your first approach can be to simply go into the attic, and grab the animal by the tail! You may want to wear gloves, to protect against a bite. Once you have it by the tail, you can simply drop it into a cage or cat carrier or pillowcase, and bring it outside. Be sure you seal shut the entry hole it was using to get into the attic, or it will just go right back in. 2) Set the trap in the area where you frequently see the possum - you can set it inside the attic if you wish. Make sure the trap is flush with the ground or attic insulation. 3) Bait the trap with stinky, meaty bait, like cat food. However, if you are worried about catching a stray cat, then bait the trap with marshmallows. 4) Check the trap each morning. Don't let a poor possum suffer in a cage trap for a long time. 5) Pick up the trap and transport it to your relocation site. In many states it is illegal to relocate a possum if you don't have proper licensing. 6) Be careful when opening the cage door to release the animal. If it is too stubborn to leave the trap, you'll have to prop the door open and blow on the animal to make it scamper out. Here is a photo of the type of mess a possum can leave when they live in your attic. 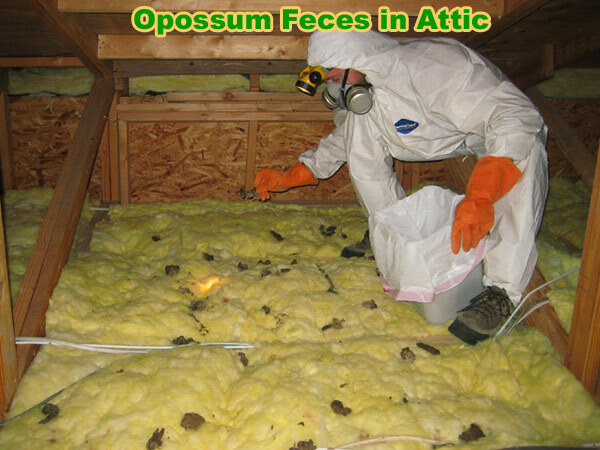 They can fill the insulation with possum feces. These feces are best removed by hand, with proper protection. 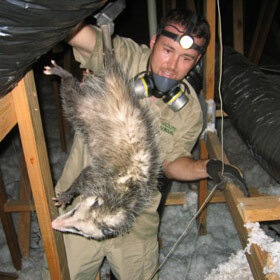 Prevent this from happening by removing opossums from the attic as quickly as possible. Go back to the How to Get Rid of Possums home page.